Context The Paediatric Emergency Department at The Royal London Hospital. The project involved a team of doctors and nurses of all grades. Problem Paediatric gastroenteritis is one of the most common presentations to in the emergency department (ED) at the Royal London Hospital, accounting for more than six percent of visits. Gastroenteritis is easy to diagnose and the vast majority of these children could be safely managed at home. The challenge with managing these children is twofold. Firstly, identifying seriously unwell children who need urgent treatment. Secondly, educating families about safe and effective management of gastroenteritis at home. Before our intervention, children who present with diarrhoea and/or vomiting are seen by an assessment nurse and a junior doctor or general practitioner, spending over two and half hours in the emergency department. Assessment of problem and analysis of its causes We quantified the scale of the problem by undertaking a retrospective audit of the care children received when they presented with gastroenteritis. Ninety percent of children who presented had a very mild illness that could have been managed safely at home. We supplemented the quantitative data with informal conversations with colleagues. There was a widespread view that many parents presented to hospital due to anxiety and/or uncertainty about how to manage their child’s illness at home. We extracted data from the electronic medical records of 580 children presenting with diarrhoea and/or vomiting. The concordance between a final diagnosis of viral gastroenteritis and the parents reporting diarrhoea or vomiting at reception was 97% and 90% respectively. Such a high concordance between symptoms and diagnosis reassures us that the assessment nurse could accurately diagnose gastroenteritis. We calculated the relative risk of serious illness depending on the presence of 16 easy to illicit clinical symptoms and signs. Based on these findings we have designed a pathway that the triage nurse will use to discharge patients. We have retrospectively tested the efficacy and safety of this new pathway. Our research suggests that half of these patients could be safely discharged by the assessment nurses using our simple protocol. Intervention We designed a criteria based discharge pathway, allowing nurses to safely discharge patients from triage without waiting to see a doctor. The discharge pathway is supported by a multilingual patient and parent education video that can be viewed in the department and on the trust website. Strategy for change After designing the discharge pathway we presented it at departmental meetings and teaching sessions in order to get feedback. Once the pathway was approved we identified’champions’ who have supported its implementation and have helped to train staff. 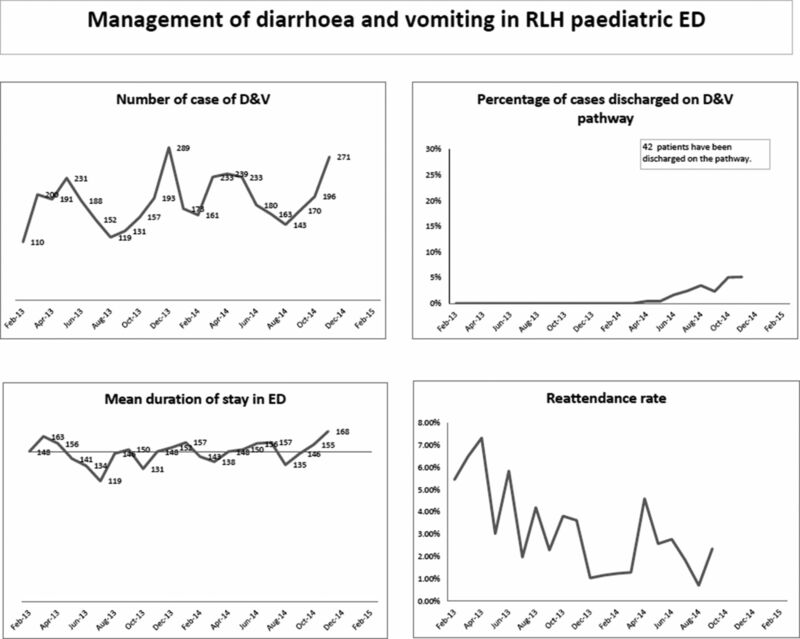 Measurement of improvement We designed a dashboard providing a visual display of the four key performance indicators: number of cases of diarrhoea and vomiting, percentage of cases discharged on the pathway, mean duration of stay in the emergency department and reattendance rate. Effects of changes 42 children have been safely discharged on the new pathway. Anecdotal feedback has been very positive. It is too early to measure the impact of the new pathway on mean duration of stay in the emergency department and reattendance rate. Lessons learnt It takes time to embed new pathways into routine care and engage stakeholders. It has been very important to build a team of people to champion the new pathway. Message for others This has been a really exciting project and was enthusiastically received by staff. It represents an innovative way of managing simple paediatric presentations and has the potential to deliver a better service to children and their parents and, we hope, a longer term effect as we are educating parents and giving them a resource they can refer back to. The video was funded by the Barts and The London Charity.